Peggy Trotter loves to take women beaten down by life and resurrect them and hopping into her stories to enjoy the journey is an adventure. This is no less true than with her latest contemporary inspirational romance novel, Reviving Jules. Believing marriage was forever, Jules Summers is stunned when her’s falls apart. She runs from her church, family and town to lick her wounds in private. And she runs away from the God she believes let it happen. humiliated, depressed and alone, she struggles to survive day by day. When a little girl appears in her backyard, she has no clue that God is showing her just how little He forgets. Rhett Carsen is the father of the little girl and strikes up a friendship with Jules. He too has been wounded by love-gone-wrong and has vowed to never remarry. But trying to work full-time and care for his precocious daughter when he needs to travel means he needs help. He enlists the lovely Jules as a nanny since she to be a teacher and has bonded with his daughter. Her life is moorless and his need for help is so great, what could be wrong with a business relationship to ensure that? The journey these two characters take is heartwarming. I’m not sure why Jules’s journey resonated so much with me but it did and watching her come alive to God, to love and to forgiveness in the wake of all the challenges she faced was a joy to read. 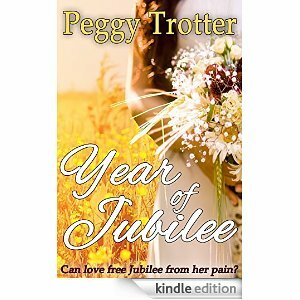 Peggy Trotter’s debut novel, Year of Jubilee is an 1850’s historical romance to tug the heartstrings. Jubilee Stallings is isolated and alone, barely surviving. Orphaned and now widowed, she struggles to accept the new property owner, Rafe Tanner, a cousin to the abusive man who had been her sorry excuse of a husband. With his arrival, her dreams of living peacefully in her home are dashed. Rafe had run away from the betrayal of his fiancée, now married to his best friend. He longs for peace and quiet and had sworn off marriage or any hopes of a wife and family. But meeting the terrorized and skittish Jubilee, he offers her a marriage in name only as they both strive to work together to make the property self-sustaining. A trip home to visit his family and introduce them to his new bride, he begins to realize that their masquerade of being a young couple in love is in fact truth. But Jubilee lives in fear of her new husband and navigating that along with the families romantic notions and a jealous ex-fiance make the trip a joy and pain. Rafe determines to win the heart of his wife. Surrounded by new friends communication get snaggled and confused as emotions cloud their relationship. As Jubilee faces her fears, can she love Rafe enough to let him go, much less keep him as her own? Could she overcome her fears and scars from her past to find a new future with a man worthy of her trust and love? This is a powerful story, filled with gripping realism and heartache and reveals some of the reality of how difficult life was during this period of time, especially for young women tortured, abused and left with no resources. Peggy Trotter handles the story with tender care and deep emotion and gives us a hard-won happy ending that reflects the joy of jubilee, freedom, and Christ’s redemptive power to change our hearts and lives.